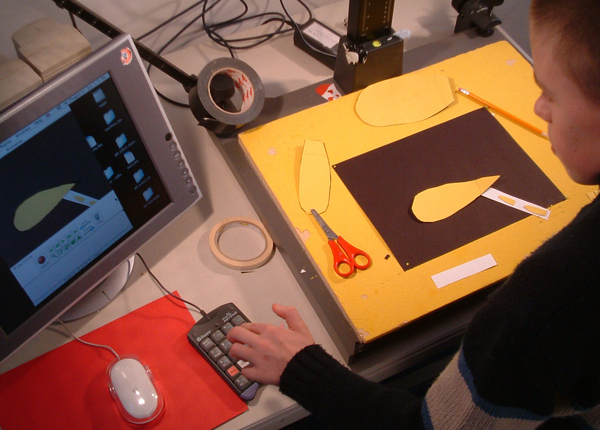 Cut-out animation is of the quickest and easiest ways of creating animation, it is suitable for children as young as 3. With a camera fixed directly above your work, items of 'flat' artwork are moved a bit at a time, and after each movement, a frame is taken. Like stop-frame model, cut-out is camera-intensive, so all animation needs to be created under the camera. Therefore, unless you have a number of set-ups, you can end up with people queuing to have a turn. Nevertheless, the great advantage is artwork can be created away from the camera and accurately prepared for filming. Ensure the background is a good size to fit on your rostrum, and is prepared on a fairly rigid piece of card, wood, or better still pinboard. One of the fantastic advantages of cutout animation is you don't have to worry about gravity and the problems that causes puppet animators. With very large backgrounds, getting the camera high enough can be a challenge, and children may need to work on the floor. When creating artwork for cut-out animation it's essential not to get confused about what belongs to the static background and what is a character or a moving element. Everything that is definitely static can be fixed down: hills, buildings, sky... However, a door might want to open, windmill blades might want to rotate... and these things mustn't be stuck down! (Instead, fix windmill blades together, pin in the centre, glue down only the building itself). It's a good idea to have an individual clear plastic pocket or A4 folder to keep loose artwork characters (etc) in - one per child or one per scene is good. Collage backgrounds can look fantastic, but it's harder to make subtle animation over very rough or undulating background, where things get snagged or roll off. 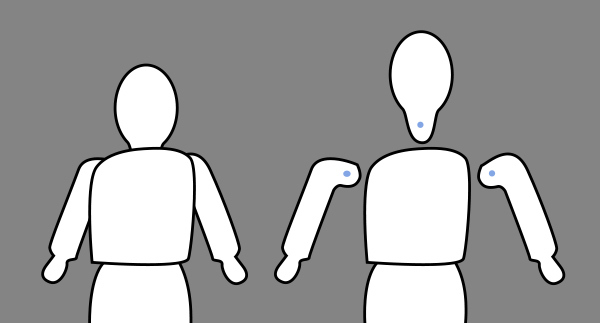 Whichever method you use, the moving limbs are the bits that need the most attention. Limbs need to be longer so they can be fixed (usually) with small pieces of blu-tack. 200-250gsm card is ideal as kids can still cut it themselves, but it is stiff enough to paint and survive hands animating it. If the painted figures are cut out by an adult, then animating with children as young as three is possible, and they can create some beautiful animation with their own original artwork! Characters don't necessarily need joints at wrists, elbows and shoulders, better animation can often be created when there is less to concentrate on - or fall apart! If something major goes wrong in your animation it is difficult to correct without going back and starting all over again. If you have only just started, this is an easy decision to make; if you're halfway through a shot it's more tricky. What can often help in these situations is a close up or a cutaway. In cut-out, this can simply be a close-up of a particular detail within the main scene. Close-ups and cut-aways are great for adding dynamics to your film. They are also necessary if you want to clearly show a particular action or object within a large complex scene (eg. someone talking). Although young people often create clouds and tree branches to animate, they rarely work well. This is partly because it is difficult to create smooth slow movements, but the main problem is remembering to animate them every go - especially when you've got seven dancing bears in the foreground! Use these background elements positively and dedicate the efforts of an animator (or two) solely to them. Almost anything can be put under the camera and animated - sand, paint, clothes, jewellery, ice, found objects, foliage etc. Likewise, almost anything can form a background. This is usually back lit, using a custom-made light-box or other back-lit system, such as a glass topped table with a layer of tracing paper. The size of the light-box will determine the space available for the animation with backgrounds and characters scaled accordingly. Silhouette animation can incorporate transparent materials such as tracing paper, tissue paper, thin layers or salt or sand, or anything else you care to try. Layers of glass can also be used to trap layers of background which you want to keep still while you animate characters on top. Animation can be monochrome, creating greys through layers of tracing paper or grey tissue paper, with black card for characters. Colour can be created using tissue paper and coloured gel. A thin layer of sand, or salt (which can be dyed with food colouring) can be manipulated with the fingers, brushes or feathers to create fluid images. Another immediate way of creating work, is by cutting out photos and images to animate. Photos can be especially created for the project so children in the group are animated within their film. Or you can create a narrative around images found in magazines. You may end up with Lady Gaga dancing cheek to cheek with Nelson Mandela on a Matisse backdrop, but that can't be all bad. The exciting thing about working under the camera is you can mix media in a multitude of ways. Objects can float over photographs, paint can explode across a collage, drawings can be mixed in with the pixelated hand of a child.